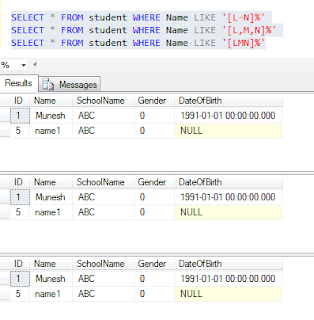 SELECT is one of the basic topic for Sql Server, which basically used to retrieval of information from Tables. Using some conditions or without conditions. 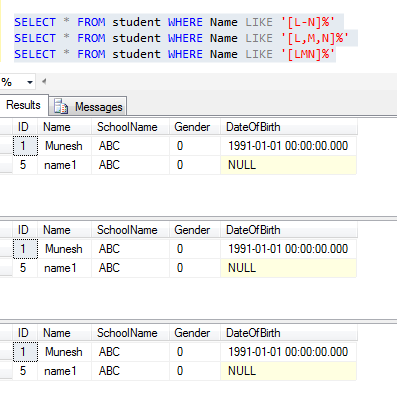 For example I create a one Student table for understanding the concept of select statement . because NULL value can’t be compared with some value (i.e. 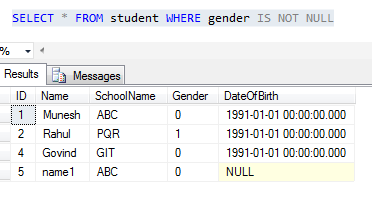 Null means unknown value, so it can’t be used to compare with any know values). 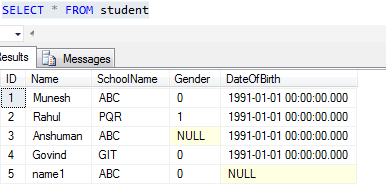 The only operation we can do with NULL is we can check whether it is NULL or NOT NULL . Get all the Student who have word ‘SH’ anywhere in their Name. 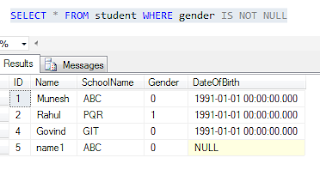 One way of avoiding NULL as the RESULT of concatenation if one of the value of the to be concatenated is NULL is to use the ISNULL function like below. 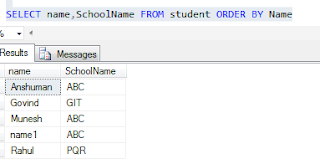 Here ISNULL function returns an empty string if the value is NULL otherwise the specified value. In our case Table does not contain NULL in Name or schoolName column. 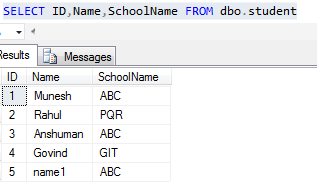 Add an empty space between Name and SchoolName.